Every sport needs a super star, a legend that makes it more interesting for the fans: In the 90’s it has been the always perfectly dressed Dominic O’Brien who won the World Memory Championships more often than anbody else until today. In the last decade however memory sports most valuable player was by far the bold bearded man with the black hat. He has the fastest memory in the world and probably the best humor among all athletes of his kind. Memory-Sports.com spoke with the self-appointed “Geek” about his roots, role models and rivals. When I was at school I was a typical geek. Memory-Sports: Tell us a little bit about your youth. Ben: My youth was completely uninteresting to anyone who wants to know about memory sports. When I was at school I was a typical geek (a late 80s, early 90s geek – I didn’t touch a computer from one week to the next), I was good at maths and I spent every spare second at school playing chess or cards with my equally geeky gang of friends. I did memorise a poem once, at the age of 12, for a school event (Macavity the Mystery Cat), but only because Mrs Slater the English teacher told me to. I suppose you could say that set me on the road to becoming a World Memory Champion, but I don’t think it really did. Memory-Sports: What was your first contact with memory sports? In 1997, I read in Mensa Magazine about a brand new event called the Mind Sports Olympiad, which was an Olympic Games for mind sports, with competitions in everything even vaguely mind-related, over the course of a week at the Royal Festival Hall in London. I decided to go along and take part in the World Intelligence Championship, a brand-new competition that involved five full days of IQ puzzles. It was great fun (I came fifth out of about twelve competitors), and I also had the opportunity to check out some of the various other board games, card games and mental skills competitions taking place there. One thing I didn’t notice at all, as far as I can remember, was the World Memory Championship, which took place as part of the MSO that year. 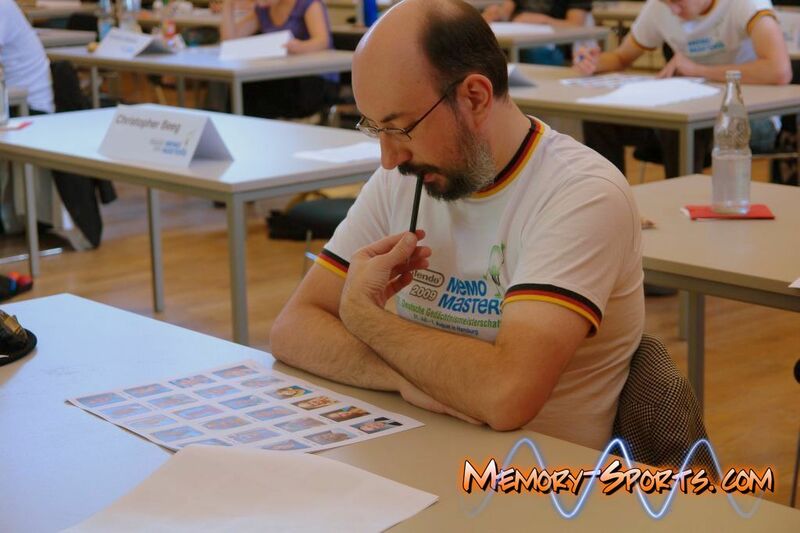 In 1998, when the MSO had relocated to the Novotel in Hammersmith with a greatly reduced budget but was still a lot of fun, I entered a lot of other competitions as well as the Intelligence, and for the first time consciously registered the existence of the World Memory Championship. On the first day of the WMC (it was a two-day competition back then) I heard that the favourite discipline there was memorising a pack of cards, and I was curious to know just how difficult that was. So I bought a pack of cards and that evening I tried to memorise it, by repeating the cards to myself until I’d got them all memorised in sequence. It took me 48 minutes. I tried to memorise a pack of cards, by repeating the cards to myself until I’d got them all memorised in sequence. It took me 48 minutes. The next day, I was sitting at a desk ready to start the Mental Calculations World Championship, somebody came in (I think it was David Levy, who in those days was one of the ‘big three’ along with Tony Buzan and Raymond Keene who ran the event) and announced that Andi Bell had broken the world record in speed cards with 34.03 seconds. The disparity between those results fascinated me, and I wondered how fast I could get if I kept practicing. So I did keep practicing over the next couple of years, whenever I had a spare moment. I got down to about fifteen minutes in the end, still without using any kind of memory techniques – I had heard them mentioned in an article (an interview with Demis Hassabis, who said he was planning to learn how to do it) but dismissed the whole journey method as some rubbish that someone had made up to sell books, which couldn’t possibly work. In 1999, at the Decamentathlon (a competition composed of puzzles in ten different mind sports, including memory), I met Tom Groves, who impressed everyone by memorising a pack of cards perfectly in five minutes and who apparently really did use those memory techniques I’d heard about. But I still wasn’t really convinced. Anyway, I was still interested in the memory championships, so when I found a gap in my MSO schedule in 2000, I decided to compete. I tried my hand at the first discipline, hour numbers, without any memory technique, and unsurprisingly got a pretty bad score, and then the second discipline was the poem, which to my surprise (and everyone else’s), I won. That was fun, I thought. Maybe if I could get good at the other disciplines, I could do well in this memory thing. Some of the other competitors managed to convince me that memory techniques really do work, so I went out and bought a book (Use Your Memory, by Tony Buzan) and read the chapters about cards and numbers – I ignored everything else in the book that wasn’t about the specific events tested in the World Memory Championship. I created a couple of journeys and a set of images for cards, and started practicing. The next day in Hour Cards, using my new system, I managed to memorise three packs, and I was very impressed. I still wasn’t fast enough to memorise a pack in under five minutes, but I got it down to seven and a half that night. I was addicted to memory techniques for life from that point onwards. Memory-Sports: Who was your role model in your early days as a memory athlete? Ben: In those days, there was only one real role model for everyone – Dominic O’Brien. He was by far and away the best memoriser in the world, and he always won the World Championships comfortably. But his main rival was Andi Bell, and I quickly became a fan of his. In 2000, just before the competition started, Andi came up to me (he had his hair in a ponytail back then, and looked very cool) and said “Hi, I’m Andi, I’m one of the other competitors,” and we had a friendly chat. I was very impressed when I found out a bit later that he was a former world champion and one of the hot favourites. In a lot of mind sports the really good players don’t talk to the nonentities at all, so this was something a bit different. And it turned out that the ‘word on the street’ was that Andi had the potential to be much, much better than Dominic if he could just get his best results more consistently (which he did eventually achieve in 2002, completely blowing away Dominic and everyone else), so I looked up to him as my major inspiration in the early days. I looked up to Andi Bell as my major inspiration in the early days. The only thing Dominic said to me during the 2000 WMC, by the way, was “Was it you who was whispering?” – in the spoken numbers, somebody could be heard very loudly whispering the first few digits to himself over and over while the rest of the digits were still playing. But it wasn’t me, it was the guy in front of me. 🙂 Also in the early days I took a lot of advice from the other British competitors, especially Robert Carder and Tom Groves, who helped me a lot. Memory-Sports: What made you to come up with the highly sophisticated “Ben System”? Ben: By 2002, I was a regular memory competitor, but I knew that I had reached the limits of the system I was using. With a basic list of 52 images for cards and 100 for numbers, if you try to memorise a 1000-digit number in an hour, each image will appear an average of five times. If you try to memorise ten packs of cards, each image will show up ten times. And that’s too much, it’s just not possible to go any further with a system like that. I managed eleventh place in the WMC that year (it was so much easier to do that back then!) using that system and a terrible category-based system for binary that I’d invented myself but which didn’t work at all (I always wanted to avoid translating binary digits into decimal and then converting them into images, so this system was my first attempt at ‘improving’ on the systems everybody else used by creating one of my own. It didn’t work, but that didn’t discourage me), but I knew I could never get any better than that if I didn’t start using a more advanced technique. In November 2002 I left my job, which I was fed up with (I’d been there since April 1996), borrowed a lot of money at a high interest rate (this debt followed me around and stopped me having any money for a long time until I finally paid it off last year) and devoted some time to ‘working out what I want to do with my life’. This included a holiday in Las Vegas, a one-month course learning to teach English as a foreign language and a lot of sitting around my flat in my pants, watching cartoons. But it also involved taking a bit of time to think about memory techniques and how to make mine better. The first step was to change to a 1000-image system for numbers. I didn’t want to do it using three Major-system consonants, though, because I thought I would learn them more easily and use them more quickly in competitions if each image was a simple one-syllable word. So I had the idea of using a vowel for the middle digit. So I created a list in that way, and practiced with it (placing three images on a location instead of two, just to see if that would work) until I was fairly sure it was better than the 100-image system I’d been using before. But I didn’t have much time for training, because of all the time I was spending sitting around in my pants, watching cartoons. It was only when I’d completely run out of money and had to get another job that I really started working on my memory system too. I didn’t have much time for training, because of all the time I was spending sitting around in my pants, watching cartoons. The inspiration sort of came out of nowhere. As far as I can remember, I was idly thinking to myself ‘What can I do with cards? Person-action-object just doesn’t work for me [I’d tried that in my failed binary system], but how else can you increase your number of images and not have the same old 52 things over and over again? An image for each pair of cards? How many would that be? 2704. That’s not much more than 1000, it sounds possible. But how to convert them into a word?’ I thought about number-suit-number-suit, but that sounded too cumbersome. And I really liked my consonant-vowel-consonant system for numbers. Hey, I thought, there are only sixteen combinations of two suits. Sixteen consonants, thirteen vowels, thirteen consonants – can I do that? Sure, let’s try! And from that, I realised that there were also sixteen combinations of four binary digits, so I could do that as 4-3-3 and use the same images to make an image for each ten-digit binary number, which is the perfect number to fit each line of 30 digits in a location! And, if I just amended a few of my 1000 decimal images (I still used ‘b’ or ‘p’ for ‘9’ in my first list, and so on), I could have a universal list of 2704 images that would cover EVERYTHING! What a cool system that would be! And so that was the moment of inspiration that turned into a couple of months of work creating images and trying to learn them all. Memory-Sports: I know you hear that question every know and then. But one last time and you can always say “Read it on Memory-Sports.com!”: How does your system work in detail? Ben: That really needs an article to itself. I’ll rewrite one of my old forum posts and turn it into a comprehensive “Ben system” guide, some time. But basically, it’s just an image of an object or person for each 3-digit decimal number, 10-digit binary number or pair of two cards, three objects in a location. Simple as that. Memory-Sports: How long and intensive did you train your system before it was ready to go in a memory championship? Memory-Sports: You are still the MVP in memory sports but athletes like Johannes Mallow, Simon Reinhard, Gunther Karsten, Wang Feng, Su Ruiqiao and many more are getting extremely close. How do you deal with that pressure? Ben: It’s no fun to be the number one. It is so much easier to improve if you’ve got someone to chase. I just try to remember that everyone on that list is better than me at at least one discipline, so I know I can keep improving if I work at it. But when it comes to a competition, I love the pressure – I always get my best results when I absolutely have to get a good score or lose the championship. It’s no fun to be the number one. It is so much easier to improve if you’ve got someone to chase. Memory-Sports: Do you think you can stay on top for much longer? Ben: It depends whether I keep in training, and whether anybody else comes up with a new system that’s better than mine. Right now, I firmly believe that my system is the best there is, and I’ve got a head-start over anybody else who wants to use it, because I’ve been doing it since 2003. But I have to keep improving every year, because everybody else is improving too. And some day, I’m sure somebody unexpected is going to turn up at a competition with a new technique and will completely wipe the floor with me. Memory-Sports: How much do you train these days? Memory-Sports: Have you thought about an even greater system than the Ben System? Ben: I have, but not seriously. Right now, I don’t need a better system, but that could all change some time soon. Maybe inspiration will strike me, but I’m not really trying to think of improvements at the moment. Memory-Sports: Give your opponents some hope: What is your greatest weakness? Ben: My opponents don’t need hope, they all know I’m inconsistent nowadays. Any one of six or seven rivals could have beaten me this year if they’d been at their absolute best. But my weakness is my lack of training, my hopelessness at Names & Faces and my lack of motivation to win the WMC again, compared to someone who’s never won it before. My weakness is my lack of training, my hopelessness at Names & Faces and my lack of motivation to win the WMC again, compared to someone who’s never won it before. 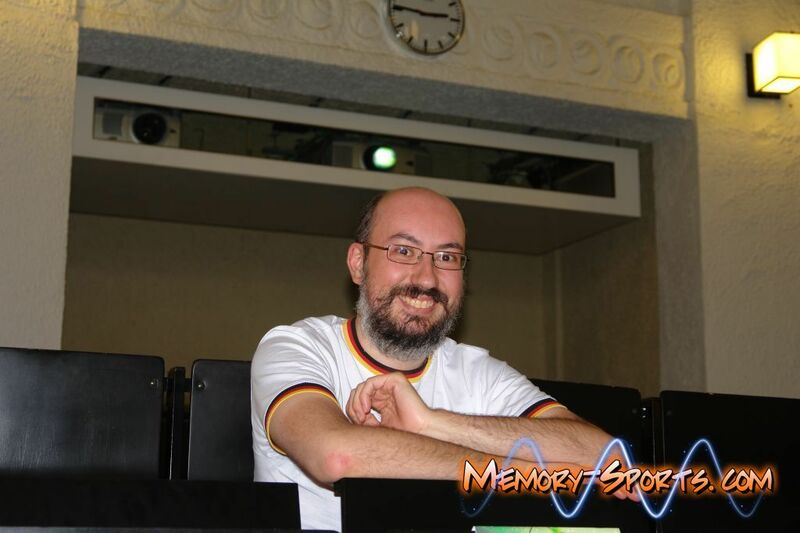 Memory-Sports: What do you expect from the next World Memory Championship in China? Ben: I’m hoping for another competition like 2009, with a whole lot of great memorisers producing amazing performances. The last World Championship was the most exciting ever, and I just hope they’re going to keep getting better! Memory-Sports: Where do you see the sport in 2020? Ben: The 2020 World Memory Championship will take place on the Moon. Tony Buzan will have recently made contact with the Royal Family of Moon-Men and agreed to hold the WMC there in return for five thousand tonnes of moon gold. Since space travel will still be restricted to astronauts, there will be no competitors at the 2020 WMC (although the press releases will still describe it as the biggest ever – the Moon-Men of course will not be eligible to compete because they’re not citizens of the World). However, down on Earth, there will be competitions in at least twenty countries, and in all of them the standard will be higher than we can even begin to imagine here in 2010. Probably. Memory-Sports: Under these circumstances I think I should join NASA. 😉 Thank you for your time.